Getting Along with Your Pet < Knowing What to Feed Your Adopted Sugar Gliders! Knowing What to Feed Your Adopted Sugar Gliders! Sugar gliders are small marsupials of the gliding opossums group. If you recently adopted a sugar glider you might know that they are nocturnal and sleep during the day. You’ll want to make sure you are ok with their active nightlife before adopting this type of pet! Sugar Gliders are extremely social beings and so adopting more than one is recommended. They are used to living in groups and this way they can be companions, play together, and also help keep each other warm! Pet Sugar Gliders are prone to low calcium levels and obesity – common issues due to improper nutrition. They need certain foods, and variety is best for this species. Not sure how or what to feed your adopted sugar gliders? Click here: http://www.peteducation.com/article.cfm?c=18+1798&aid=2442 for in-depth information on how to best keep them healthy! 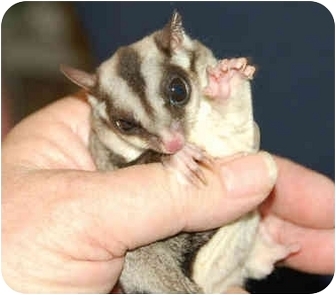 You can find Sugar Gliders for adoption on Adopt-a-Pet.com under the “small animals” search at http://www.adoptapet.com/other-pet-adoption.